Bank of India Recruitment 2018: Bank of India has notified 158 officer (credit) vacancies in the general banking stream. Interested and eligible aspirants can apply from 20th April onwards. Candidates can hurry up to apply for Bank of India Officer posts as there is not much time for the last date. The last date to apply for BOI Officer Posts is 5th May. Hence candidates can proceed to apply soon. The online application form will be available at bankofindia.co.in. Candidates can fill up the online application on the website. Also, the Officer notification PDF will be accessible to download on official portal. Applicants can download and observe all the details keenly once before applying for the Bank of India jobs. Bank of India is one of the well-known banks of India. It serves the nation with its various banking services. The BOI is having large number of clients across India. And also the bank has widely spread across India. Annually, it drafts various recruitment notifications to hire the eligible personnel for various jobs. 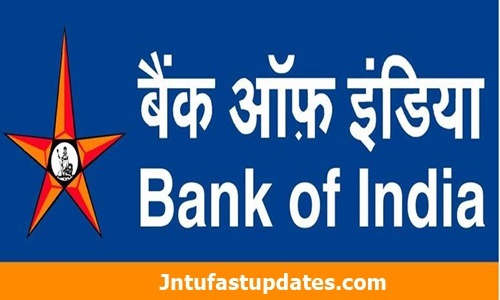 The Bank of India has announced Junior Management Grade Scale -1 (JMGS I) posts. The number of vacancies advertised is 158. Candidates having the suitable eligibility criteria can apply for the announced posts before 5th May. Candidates will be shortlisted through written test and interview rounds. As per the notification, the Bank of India is going to conduct the written test on 10th June for the announced posts. A Degree (Graduation) in any discipline with minimum 60% marks along with MBA/PGDBM/PGDM/PGBM/PGDBA from institute of repute (two/three-year programme) / Post-graduation degree in Commerce/ Science /Economics. (candidates appearing in the final year of examination of MBA/PGDBM/PGDM/PGBM/PGDBA from institute of repute (two/three-year programme) / Post-graduation degree in Commerce/ Science / Economics are eligible to apply, However their final result should be declared on or before 30th June 2018.) OR Chartered Accountant OR ICWA OR Company Secretary A certification in computer course for minimum three months OR Information Technology or related paper as one of the subjects at graduation level or afterwards, is a must. The applicant’s minimum and maximum age as on April 1, 2018, should be 21 and 30. Go to the Career’s section on the homepage. Click On “Recruitment of Officers in General Banking Stream – Project No. 2018-19/1 Notice dated 01.04.2018”. Go through the details from the notification. Register with the site by tapping on “Click here for New Registration” and enter name, contact details and email-id. Give the provisional register number and password, which is generated by the system. After registering with the site, fill up the application. Check the details clearly once and click on ‘Submit’ button. Upload the photo, signature as per the guidelines given on notification. Pay the requisite application fee using any debit/credit cards. After that candidates will receive e-receipt. Take a printout of e-receipt and online application form.